A digital image that was acquired by the San Diego Air and Space Museum. Image TVL1970 PRO 7mo. “The photos of TBM Avengers in this latest collection with the crudely painted registrations (most with the “N658*D”-series such as N6583D above in the background), appear to be aircraft purchased and operated by Simsbury Flying Service based in Simsbury, Connecticut, in the 1950s.” SDASM Archives. Did the Simsbury TBMs Spray in Maine in 1958? Simsbury Flying Service’s eight Avengers would have been flying and spraying in the 1960s to 1970s. However, I’ve learned that eight of them sprayed in Aroostook Co. Maine in 1958, and which is just over the border from New Brunswick. This, however, seems a few years too early, considering most dates I have seen are, e.g., 1963-1977, but the record is in two FPL history reports. Simsbury was familiar to Forest Protection Limited as yellow Simsbury Stearmans sprayed for budworm in 1957 (1) and 1958 (4). I have gleaned these eight identifications from various places on the Web, and Randie Coulter, in response to my query on the AgAircraft list, also helped me out. The State of Maine launched its second budworm spraying program in 1958. A total of 302,000 acres in northeastern Aroostook County were sprayed … The spraying was carried out by the Simsbury Flying Service of Simsbury, Connecticut, with a fleet of eight converted torpedo bombers and two Stearmans for use around irregular boundaries, lakes, and streams. Instead of supplying airplanes, FPL supplied Maine with 1.14 million litres of DDT and assisted in a consulting capacity. Applications in Maine were made by Simsbury Flying Services of Connecticut. Since Aroostook County is very close to the areas sprayed in New Brunswick, and since some of their TBMs eventually were purchased by Canadian companies, I decided to find out more about the eight Simsbury TBMs, listed under registration and Bureau Number below. All of these Simsbury TBMs originated from the Royal Canadian Navy, which is unusual as most of the RCN Avengers went to Canadian companies. See Military Origins. Randie Coulter says: All of the planes you have listed were struck from the RCN in 1958. The earliest I find any of them registered to Simsbury is 1960, although I found they apparently had possession of 85983 [N4039A] in 1958 but, as stated, it wasn’t converted by Simsbury. If it was, ”Did they fly in Aroostook Co. Maine in 1958?” I would have to say, no. At least not with Simsbury as far as I can tell. Bob Parrick (pers. comm. 2013) writes: Don’t know if I can help much. I recall that Simsbury Flying service had 5 TBM’s, a Douglas B-18 and some Stearmans during the 60’s. [Parrick posted an image of Simsbury TBM N6580D at airliners.net.] I had a part ownership in a Stinson we based at Simsbury 1959-60. Although I saw these planes often I don’t ever recall seeing the TBMs or the Douglas actually fly. Here’s another eye-witness account [Dave Lindauer, in a post to the Warbird Information Exchange, Nov. 10, 2009]: I’ve always had a soft spot for Canadian Avengers. I’ve always thought that they were the best looking of the turret less TBMs. When I was about 14 or 15 I would ride my bicycle 10 miles to Simsbury Airport (Connecticut) to look at the last couple of Simsbury Flying Service TBMs. Previously there had been something like 7 or 8 flying there, parked in a neat row close to the road. My dad used to slow way down as we drove past so I could see them! (Not much, but very exciting to a blossoming warbird fan.) After pulling up on my bike, the airport staff let me climb all over the last airframe (engineless & wingless), with the restrictions being that I shouldn’t take or break anything, not touch any of the other private airplanes and stay away from spinning propellers. How times have changed! Conclusion: It’s very doubtful that any of these Avengers sprayed in Maine in 1958, given the dates of their acquisition. Perhaps Simsbury had leased some other Avengers for that project; if so, I have not found any records to confirm that. The six-minute clip can be seen on You Tube. The registration of N33BM is clearly evident, and N6583D is the one whose engine is running. Delivered to RCN as 53119. BOC: May 29, 1952. SOC: May 9, 1958. Simsbury Flying Service, Simsbury, Connecticut, 19??. Baron Volkmer, Dallas, Texas, 1970-1973. Registered as N33BM. Merrill McBride, a pilot who flew an Avenger in the aerial spray program up until he was killed in the crash of CF-ZTA in 1974, photographed N33BM likely in 1973, location unknown. Baron Volkmer’s TBM, registered as N33BM. Delivered to RCN as 85983. BOC: May 29, 1952. SOC: Mar. 26, 1958. Simsbury Flying Service, Simsbury, Connecticut, 1964-1972. Registered as N4039A. Stored, unconverted, Simsbury, Connecticut, 1958-1972. Miramichi Air Service, Douglastown, New Brunswick, May 1974-1979. Registered as CF-BEG. Hicks & Lawrence Ltd, St. Thomas, Ontario, 1978-1985. Registered as C-FBEG. Flew as tanker #1/”Yogi Bear”. A TBM-3S AS Mk.3. Delivered to RCN as 53489 / 304. BOC: July 28, 1950. SOC: Jan. 30, 1958. Simsbury Flying Service, Simsbury, Connecticut, 1960. Registered as N6580D. Stripped, unconverted, fuselage stored on gear, Simsbury, Connecticut, 1972-1990. The hulk was purchased first by Leonard Tanner, Barre, MA, 1988-1990, then by Corwin H. “Corky” Meyer, Ocala, FL, 1990. The hulk moved to FL, 1989 then used in restoration of BuNo 91521 (N4171A). Reported in 1972 derelict at Simsbury still in RCN colors, and destroyed by fire, 1990. Delivered to RCN as 53760. BOC: June 16, 1952. SOC: Jan. 30, 1958. Simsbury Flying Service, Simsbury, Connecticut, 1963-1977. Registered as N6581D. Richard Foote/Professional Aircraft Sales Co., Willimantic, Connecticut and New Smyrna Beach, FL, 1984-1988. Crashed and destroyed on take-off, near Danielson, Connecticut, Aug. 4, 1986. 1948 Grumman TBM-3E Avenger. Delivered to RCN as 85506. BOC: June 16, 1952. SOC: Jan. 30, 1958. Simsbury Flying Service, Simsbury, Connecticut, 1963-1966. Registered as N6582D. 1945 Grumman TBM-3E Avenger. Delivered to RCN as 53503. BOC: June 30, 1950. SOC: Jan. 1, 1958. TBM 53503 flew in the RCN 881 Squadron from the carrier HMCS Magnificent and marked as sub hunter “ABK”, “AB*P” and later “315” as their numbering system changed over her years of duty. She also flew in this role as part of the flypast for the newly coronated Queen Elizabeth II’s Royal Navy Review at Spithead on June 16, 1953. TBM 53503 is documented as being Struck Off Charge on January 1, 1958. From the Confederate Air Force history of this TBM (HERE). 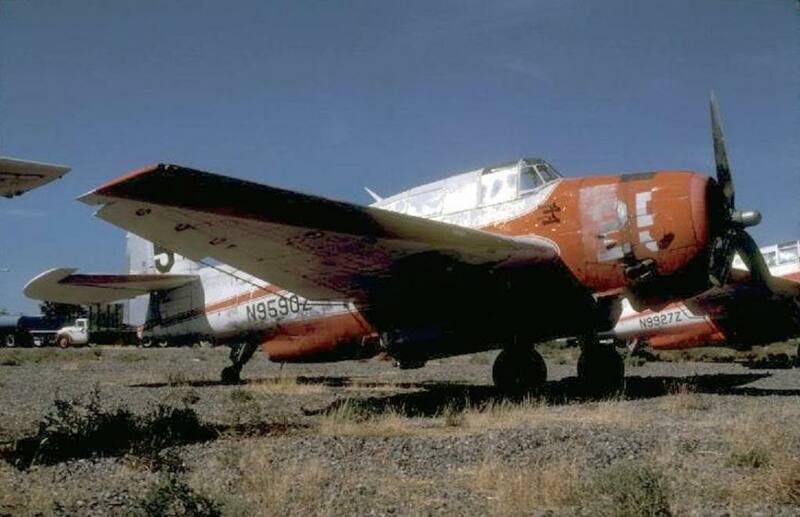 After her RCN military career ended in 1958, TBM 53503 was an aerial insecticide applicator from 1963 to 1970 for the Simsbury Flying Service in Simsbury, CT as N6583D. Acquired by the CAF in 1970 where she was painted as VT-10’s “white 82” with a tri-color Navy scheme for the CV-10 Yorktown, but still lacked the characteristic dorsal gun turret. She flew with the CAF Ghost Squadron until 1981 in this configuration. During this time, her movie debut can be seen in the first five minutes of the movie Close Encounters of the Third Kind as directed by Steven Spielburg – hint: she is the one whose engine runs! Joe E. Jones/Confederate Air Force, Harlingen, Texas, 1970-1972. Robert L. Wick/CAF, Harlingen, Texas, Jan. 13, 1972-1991. Registered as N53503. Commemorative Air Force, Harlingen, Texas, Jan. 13, 1972-2007. Registered as N53503. Flown as USN/82 (later USN/309). Delivered to RCN October 1950 as 85829 / #369. BOC: Oct. 19, 1950. SOC: Jan. 30, 1958. To the US as N6584D with Simsbury Flying Service, Connecticut. Maritime Air Service Ltd, Moncton, New Brunswick. #911 CF-XON 1969-72. Hicks & Lawrence Ltd, Tillonsburg, Ontario, 1972-1975. Crashed during spray operations, Juniper, New Brunswick, May 21, 1974. To US civil registry N6586D, Simsbury Flying Service, Simsbury, Connecticut. To Canadian civil record as CF-XOO with Maritime Air Services, Moncton, N.B. Crashed and burned at Deer Lake, Newfoundland, 13 July, 1969. Frederick A. Johnsen’s video book Fire Bombers in Action presents a list of U.S. companies that had fire bombers. These are listed below under each state. Stanley Miller is proud of the planes and of the work done by his father’s business. For all spraying services, pesticides, fertilizer, and other farming needs. Source: Dalhart High School – Lone Wolf Yearbook (Dalhart, Texas) – Class of 1974 (p. 208). N7002C / 85632 before it flew as #B18 for Air Tankers of Wyoming and GOBJ of Hicks and Lawrence of Ontario. N9599C / BuNo not known before it went to Air Tankers of Wyoming. 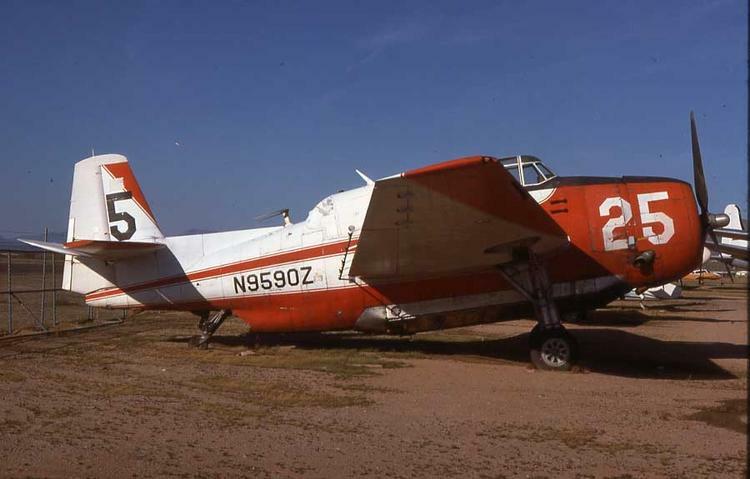 Air Tankers’ TBM #B14 N9599C was contracted to spray in NB but crashed in Iowa on 20 May 1971 before arriving. [Delmer Maurice] Miller was born May 13, 1914, in Numa, Iowa, to Stanley and Evelyn Stanton Miller. On March 27, 1937, he married Shirley Davis. Uncle Sam called and between 1940 to 1945, he trained in the Army Air Corps, which rated him as the wing commander and director of flying. In September 1945, he founded Plains Aero Service in Amarillo. If not the first, he was one of the earliest commercial appliers of 2-4D by air. This was the beginning of a legacy. Delmer’s operation moved to Dalhart in 1956. [Mr.] Miller, 90, died Wednesday, Sept. 8, 2004, in Germantown, Tenn.
D&D may have owned three Avengers, one of which went to Norfolk Aerial Spraying in Ontario as CF-AYL. US Navy as Bu. 86091, 1960. Cisco Aircraft Inc, Lancaster, CA, #E82, 1962-1964. D&D Aero Spraying, Rantoul, KS, 1966-1969. 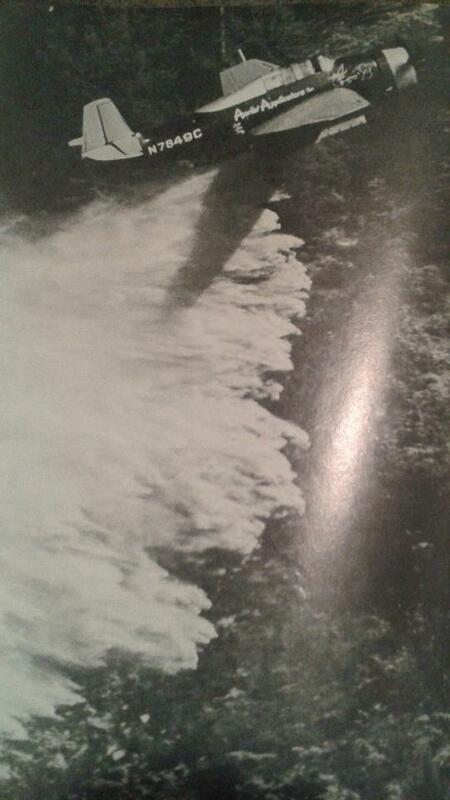 Norfolk Aerial Spraying, Nixon, Ontario, 1970-1973, CF-AYL. Crashed in New Brunswick during spraying operations, June 17, 1973. Frontier Airways, Visalia, CA, 1963-194. Operated by Clayton V. Curtis, Boise, ID, 1963, #D5. Loening Air Inc, Boise, ID, 1966. Clayton V. Curtis, Boise, ID, 1969-1970. Bill Dempsay/D&D Aero Spray, Rantoul, KS, 1972. James Levrett, Reno, NV, 1977. Pima Air & Space Museum, Tucson, AZ, 1983-2002. – Displayed as USN 69472. Registered as N9595C by ?? ?, 1957. Cisco Aircraft Inc, Lancaster, CA, 1962-1964, #E67. Bill Dempsay/D&D Aero Spray, Rantoul, KS, 1966-1977. Crashed and destroyed after striking trees while spraying, Tucketon, NJ, June 2, 1967. 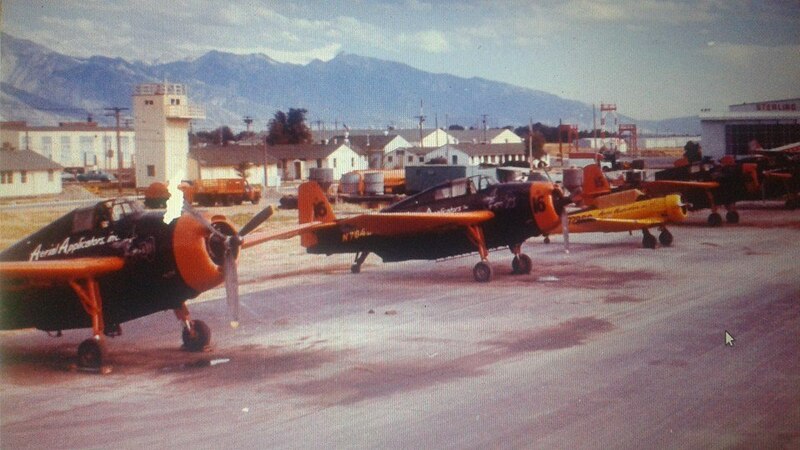 Aerial Applicators of Salt Lake City appeared to have owned eight TBMs, of which six were numbered D15, D16, D17, D18, D19 and D20. Four of them eventually ended up with Hicks and Lawrence in Ontario. [Bob Forbes] was in Salmon, ID in 1961 at the airport and there were 2 or 3 Aerial Applicator TBM’s flying out of there, sort of. They were by far the worse looking aircraft I ever saw. They did manage to keep at least one flying between break downs. One even aborted a take off AFTER barely getting airborne and getting it back on the runway and getting it stopped before he ran out of runway. – Posted to TBMs – Mil & Civ on 1 Dec 14. N7849C / 91617, may have crashed early in the sixties. See image below. This is an interesting TBM, not much info on it, except that it was Aerial Applicators and BuNo 91617. I can’t see any number on the nose. N7849C fire bombing. Posted by Mike Rawson 4 Jan 2015 to TBMs – Mil & Civ. The Air Tanker Base at Salt Lake City. Posted by Mike Rawson 2 Jan 2015 to TBMs – Mil & Civ. One Avenger flew in New Brunswick in 1971, N9590Z #C25. … the aircraft at Falcon Field belong to Gene Packard. Gene (full name Richard Eugene Packard) is somewhat of an icon in the airtanker/sprayer world. He started off in the 1950s/1960s, when he co-founded Aircraft Specialties Inc., together with Abe Sellards. They flew … out of Falcon Field, mainly on spraying contracts. In 1981 Gene reorganized that company into the well-known Globe Air, also based at Falcon Field. Globe Air went into voluntary liquidation in 1985, and their fleet was sold at the famous Globe Air auction [on 23] October 1985. But Gene didn’t stop there, because a year later he established his third company… This was Air Response Inc. …, which was formed as a family business by Gene and his son Ed. They took over some of the former Globe Air DC-4s and Harpoons, and continued to operate them out of Falcon Field. N7850C / 69355 / 1966 / #? N9590Z #25 when it was with Aircraft Specialties, April 1977. Martin Kyburz. 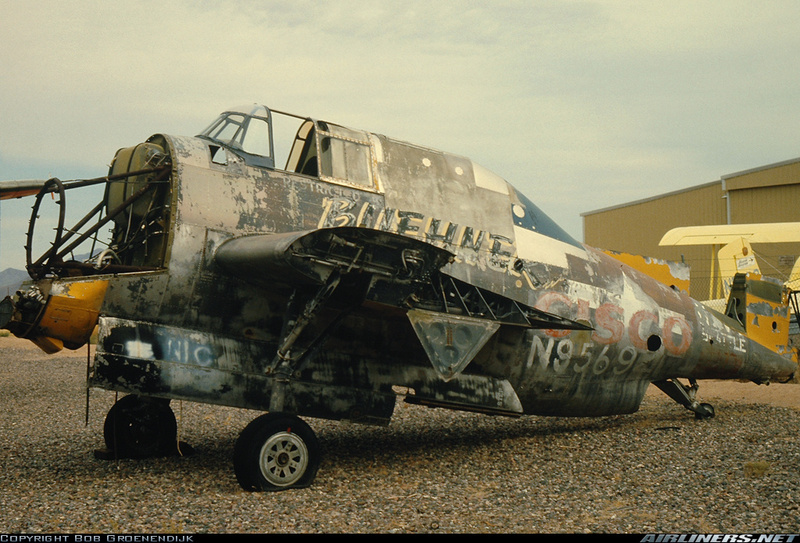 Globe Air Tanker #25 In storage, Arizona, Summer 1980, looking a little more worse for wear. N9569Z (91436) has an interesting history, as told by the Liberty Aviation Museum, Port Clinton, Ohio. 91436 was sold by the USN at Naval Air Station North Island, San Diego, California, to the Selk Company of North Hollywood for $2,600 on January 25, 1957, and assigned the civil registration N9569Z. Subsequent owners included Aerial Services of Chino, California, Zack Monroe of Lancaster, California, and Cisco Aircraft Inc., also of of Lancaster. Cisco fitted the aircraft with tanks for aerial spraying or fire fighting. In 1963, N9569Z was acquired by Desert Aviation Services of Phoenix, Arizona, who is believed to have operated it for a couple of seasons. Sometime during the 1960s, the outer wing panels were removed and the aircraft was towed to downtown Phoenix, where it was operated by Desert Aviation Service for the Buehner Window Company as a wind machine for product testing. Desert Aviation Service became Aircraft Specialties, Inc. who continued to operate the wind machine for Buehner until the mid 1970s when the plane was towed to Falcon Field in Mesa, Arizona, for storage and to use as a spare parts source. Aircraft Specialties became Globe Air, Inc. in 1980. This aircraft was sold at the auction of Globe Air assets that was held on October 23, 1985 at Falcon Field. Subsequently, N9569Z was trucked to Tom Reilly Vintage Aircraft in Kissimmee, Florida, where restoration to flying condition started. This is the image from photographer Bob Groenendijk at Airliners.net, taken in September 1981 at Falcon Field. The registration and the company names of Cisco and Buehner are clearly evident.